I wonder whether most guys are out to the bars to look at good looking girls or they are out to be inspired to come back home to find good looking wife waiting for them. ha ha... Drinking beers are what most of us do after a hard day at work. No wonder our girlfriends and wives looked so much better after some drinks. I m sure the alcohol is magical afterall. Man & woman are two different kind of products. God created man first. Woman was supposed to be created to please man. However, ever since Eve ate the forbidden apple, all women had forgotten their role. When men hit the jackpot, they are too happy to share their joy with their women first. Sad to say, not women. They would think of the diamonds first instead. These are the instinct of men and women. You can't change them. Othewise, why create two different sexes in the first place. God wanted it this way, to have more purposes in lives. 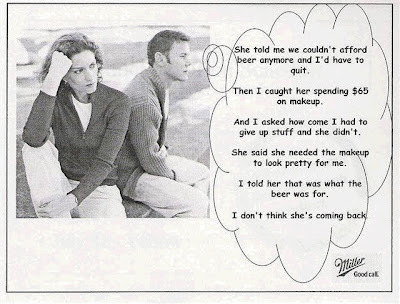 Therefore, let her buy the makeup and we, men go for our drinks. Don't believe me, you can ask God!